I was too young to remember this happening, but I do vaguely remember hearing about it while growing up: the story of a young Cubbie named Rick Monday, who became an American hero by doing what he felt was the right thing. Monday was playing center field for the Chicago Cubs on April 25, 1976, at Dodger Stadium when he noticed two protesters kneeling on the grass in left-center, intending to burn the American flag. He immediately bolted toward them and snatched it away. 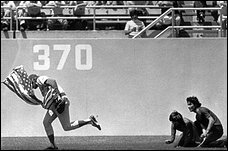 In honor of the 30th anniversary of his saving the American flag on April 25, 1976, the Los Angeles Dodgers will recognize Rick Monday on Sunday, April 23 with a video tribute. Monday, a Dodger broadcaster, will also be on hand to throw out the first ceremonial pitch. Hell yeah, good on ya brother!